bean casserole, crock pot meals, homeless shelter, one dish meal, one pot meal, Open Doors Thermal Shelter, Trinity Presbyterian Church, Whatever Happened to Dinner? Our church helped host Open Doors, a roving community thermal homeless shelter hosted in area churches a few weeks back (the program runs from November until April). This year I signed up to make food. 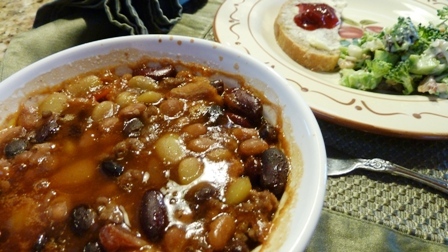 Mary Lou McMillin, a wonderful cook and hostess sent me this recipe the planners had organized for one night, called simply “One Pot Dinner.” It includes several kinds of beans, ground beef, and bacon—loaded with protein which helps fire the fuel that keeps us warmer, internally. While the shelter is great resource overnight, all guests must be back out on the street by 7 a.m., which is sometimes a brutally cold and harsh reminder of the reality of life on the streets. Other years I’ve cleaned the bathrooms in the morning and for me it was hard to see them having to get up and vacate so early. Some of course go to jobs even as they seek shelter overnight with the program, as they try to get back on their feet and save up enough money for a rent deposit. At any rate, this is a hearty and flavorful meal for anytime you want an easy dinner ready after work, or to take to a potluck. I’m sure it’s tasty even without the extra flavor of the bacon, if you want to skip that, and you can substitute the beans of your choice. We enjoyed the small dish I set aside for our own evening dinner. Brown ground beef in skilled; drain off fat and put beef in crock pot. Brown bacon and onions; drain off fat. Add bacon and onions and remaining ingredients to crock pot. Stir together well. Cover and cook on low for 4-9 hours. 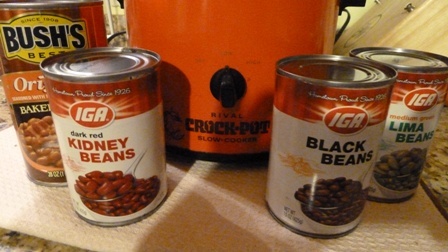 Beans before cooking in crock pot. Add salad and bread for a complete meal. Do you have a go-to crock pot meal you love? Or, have you helped with a homeless shelter at your church or elsewhere? Reflections? Have you been homeless–or had to couch surf for awhile? It happens in the best of families. For more recipes and inspiration on how to manage regular family meals together, check out my book, Whatever Happened to Dinner?, a United Methodist Women’s Reading Program Book Selection for this year. It was even more tasty than I imagined. Thx! You have such a servant’s heart, Melodie. This post is another example of Christ’s love in action. Thank you for encouraging us with good news in our forlorn world. Thanks, Marian. That’s very sweet. I wasn’t thinking of it that way because others spend all night there as hosts, sleeping on those cots! But thanks, our church is very outreach minded. This recipe sounds like Calico Beans. 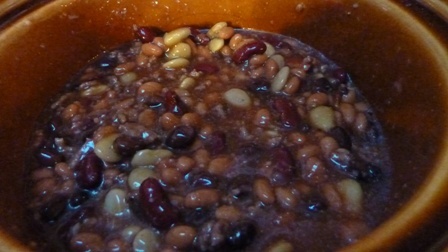 We make it sometimes in place of Boston baked beans since it is faster as uses canned beans. I never add meat to it as use it as a side dish. But for a one dish meal I suppose the meat would be OK. Right, I wouldn’t use meat for these beans in a side dish either. So you always make Boston baked beans from scratch, as in soaking the beans? I’m impressed! Thanks for commenting! Homemade baked beans are so easy. There are even recipes to make them in the crockpot, which I am going to try this year. I make a large batch at once in the oven, at least 2 pounds of dry beans. I put extra 2 cup containers in the freezer so it easy to have baked beans in a hurry for whenever we want a side of them or just beans over toast.